i got 10 points from the first battle, but in the next two battles i got only one! Shouldn't it be supposed to occur only in the 3rd battle instead of the 2nd one? I hope they get this fixed before the tourney ends. 8 points could make the difference between 1st and 2nd. It's intentional that you only get +1 after some fights so you don't farm against same player. admin wrote: It's intentional that you only get +1 after some fights so you don't farm against same player. Yes, but don't it starts occuring at the 3rd battle? because it started happening in the second battle! It's probably because you attacked once before within the long cool-down period. We checked and tested the code and it's correct. I do not understand about "checked the code it is right". I've been in a arena quite a bit on and off and when two players who have done zero fights in arena that tourney pair off, it is 10 points gained and lost for 1st battle, 9 points gained and lost for 2nd battle, and 1 point gained and 8 points lost for the 3rd battle if the same person is victor each time. I do not need to check code with the standings image below to know that Guilherme won 2 battles against Rayzzor and it is the only 2 battles either has had in this tourney. Therefore, whether the code checks out or not, you can see there is a problem. Guilherme should have been awarded +19 and Rayzzor -19. 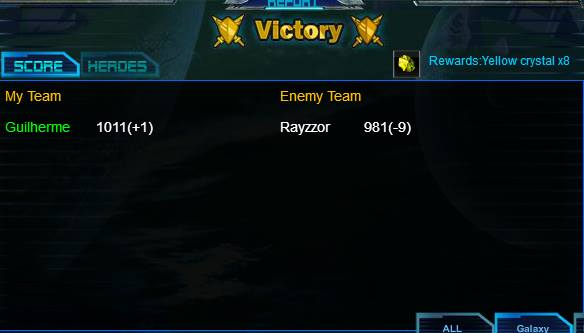 After the 3 rd battle they had since the below standings image was posted, Guilherme should be +20 and Rayzzor -27. Just wait till macca has got his pieces, you are the only real people in there, everyone else is just 'helpers'. I hardly think it is fair that our gal is expected to space out our winners when in the past people have arranged for ties by matching their fights exactly. Personally, I love the deck fights of arena. In fact, I wish their could be an option for 4 vs 4 with 2 minute timer per turn so real strategizing could be done between team members. 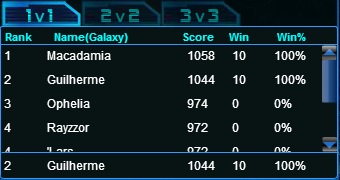 Unfortunately, arena has not worked out as it was conceived because there are not enough people playing it regularly. To know many ties were arranged within the arena in the past and not allow planned ties now is unfair to us latter players. 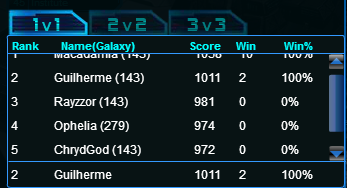 I could understand if we were ruining arena for others trying to contend but nobody has been. There is nothing stopping you getting even scores, its even easier now you only have to do 10 fights. Even with the bug you can even things out if you know how the arena points work. I would be happy to help if it wasn't for the child complaining about the arena (even though they never actually played after) and getting my alts banned. admin wrote: It's probably because you attacked once before within the long cool-down period. We checked and tested the code and it's correct. But i am pretty sure the WoH is glitched some way! can you give a deeper look at it, admin, if possible?